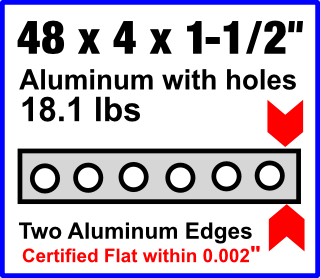 Precision Aluminum 4 ft. Straight Edge - 48 x 4 x 1-1/2"
We make every effort to make sure no one gets hurt with our products, but if you use a straight edge as a club and then beat someone over the head, it’s really not our fault. Do not drop our heavy tooling on any body part as it may cause pain and injury. Lifting heavy items can cause back injuries. Our tooling may have oil covered surfaces and sharp edges so prevent injuries by taking appropriate safety precautions that may include using appropriate gloves and lifting straps. The Seller shall also not be liable for any consequential damages resulting from the use of this product. We accept returns for defective or damaged items only with prior authorization. Call us at 937-438-8031 for Return Authorization number. If the items are found to be not as specified, we will either correct the problem or replace the item.